The IEC 60320 C13 is a grounded 3 Wire connector rated up to 250V and 15 Amps. The C13 mates with a C14 inlet, and is commonly used in a jumper cable scenario in IT Installations providing power from a PDU to a server, router, switch or other computing device. Most people know the C13 as 'the thing that plugs into my computer' because it is the standard connector used to power most desktop computers. In a desktop computer application, the most common cable is the NEMA 5-15P to C13, which connects your standard North American wall outlet to a desktop computer. Cables with an "OPEN" plug, also known as whips, are used when you will be either hardwiring the cable to an outlet/device or if you will be wiring on your own connector. Our "open-ended" cables are available in custom ROJ (Remove Outer Jacket) and Strip (strip jacket off of conductors) lengths to meet your specific requirements. 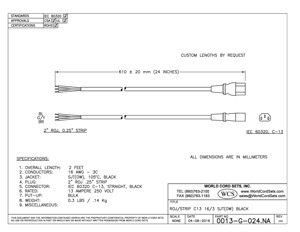 World Cord Sets, Inc is a leading distributor and manufacturer of Black 13A OPEN to IEC 60320 C13 Power Cords's. Besides stocking North America Power Cords, International Power Cords, GFCI's, RCD's, Data Center Cables, and more, World Cord Sets is a leader in custom Power Cords, Data Cables, GFCI's and more , including C13 to OPEN (WHIPS PIGTAILS) . With the ability to assemble small quantity custom products, or mold custom cables for large orders, we have the cable to fit your needs. Visit our Power Cable Matrix to find the Plug/Connector configuration you are looking for.